Dark Future: Blood Red States is going to hold a free beta weekend April 11-14, and developer Auroch Digital has opened signups for players interested in trying out their spin on the classic Games Workshop post-apocalyptic car combat tabletop game. 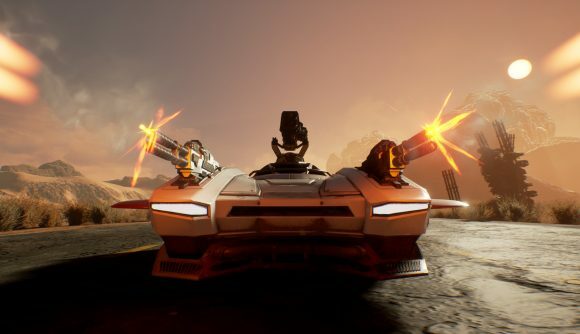 The basic idea behind Dark Future: Blood Red States is pretty simple: it’s pretty much the Games Workshop version of Mad Max, where you strap lots of machine guns and missile launchers to a muscle car, drive at high speeds, and see what happens. In practice, it’s a roguelike experience that lets you slow time down in order to issue commands to fire weapons and perform maneuvers along the highway. You’ll have an array of weapons to work with, including the missile launchers and machine guns mentioned above, plus rear-facing weapons like mines that can be deployed to waylay enemies who are gaining on you (or maybe just trying to overtake you). You’ll want to be careful, though, because this roguelike game features permadeath. Each run will be unique, and there’s no safety net – either survive the trip through the blasted wasteland of the future, or be left smoldering on the side of the highway. Here’s a trailer, which breaks down Dark Future’s mechanics. Auroch Digital has adapted several board games for digital audiences over the past few years, including Steve Jackson’s Ogre and Games Workshop’s Chainsaw Warrior. To sign up for the Dark Future beta, head over to Auroch’s blog and follow the directions. You’ll be prompted to follow a link, where you’ll be able to fill in your name and email address. Players who complete a survey after playing the demo will also get a discount code for 5% off the game when it launches later this year.